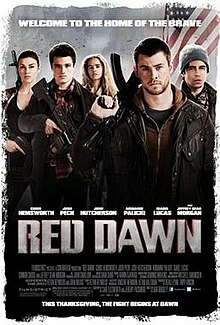 Red Dawn is a remake of the cold war classic of the same name. It follows similar themes, but the story has been completely rewritten. The prologue refocuses your fears on America’s debt problems, our cyber security weaknesses, the militarism of North Korea, and the loose association of Russia and North Korea. Between real and fudged current events, you are left with the feeling that our demise at the hands of foreign invaders is imminent. For a moment I was confused, and expected to see commercials for gold buying, seed hoarding, and emergency rations. When the story began, and I saw Matt Eckert (Josh Peck) take the football field with older brother Jedd Eckert (Thor) looking on, I was bracing for the worst. You see, Matt isn’t a team player- and when he ignores the coach, his Wolverine teammates lose the game. Jedd is a Marine back from a tour in Iraq. Their Dad is the town sheriff, but he bites it pretty early so we’ll move on. Their town loses power and they go to bed, waking up the next morning to explosions and gunfire. They look out the window and, Sweet Lady Liberty! What appears to be hundreds of North Korean troops are floating down out of the sky and dropping all over suburbia. The expected chaos ensues, but a small band of teenagers led by GI Jedd make it into the woods where they vow to kill more North Koreans than starvation and fascism combined. They give lip service to the inane idea that North Korea could successfully invade the United States by describing an electronic weapon that acts like an EMP. They don’t go into detail, but they make the scarcity of information work to support the mindset of a group of kids thrown into a war zone with no communication to the outside world. You get the idea that Russia is in bed with the North Koreans, with some of those details hammered out by the arrival of additional militia. The movie doesn’t concern itself with the geopolitical climate, only one groups stand against their local leader. Unlike many war movies, you don’t see the president, you don’t see the pentagon, and you don’t see behind the closed doors of all the decision makers. I appreciated the narrower scope of the film. The filmmakers put together a decent story with some great action all while avoiding some of the more tempting cliches- guns jammed, girls hair looked messy, and not everyone makes it out alive. If you are looking for a lighter action movie, then get your American Flag lapel pin on and go see Red Dawn. You want to see commies getting shot, even if they are just crummy ol’ starving North Koreans. You believe violence solves everything. You want an action film that avoids some of the typical action film tropes. You are looking for a grittier, darker version of the original. You want to see some character development. You like to see the big, geopolitical picture.